There are those who predicted that the years from 2010 to 2020 would become known as the “transparency” decade, in which no one would be able to “live a lie”. It is perhaps not turning out to be as clear-cut as it might have seemed then, especially when we are having such issues with fake news and the apparent smokescreens created by certain people and organisations in positions of power. It is hard to remember that there was once a time when you did not always know what your friends were up to. A time long ago when, in order to hear their news, you would need to phone them or arrange to meet them face-to-face. Since Facebook began in 2004 and Twitter in 2006, there has been an explosion in the use of social media. On the internet, something like 1400 blog posts are produced every minute. Dozens of hours of video are uploaded per minute. And tens of thousands of images are shared every minute. Facebook data from May 2016 indicated that there were 36.45 million users in the UK alone, equating with almost 60% of the UK population. We’re not good at protecting our own confidentiality. It seems that we like to be “transparent”. Social media accounts are both a diary and a photo album, highlighting the thoughts and activities of individuals. This is what makes them so valuable as evidence, for example, in relation to personal injury claims. Whilst few people would feel comfortable leafing through a handwritten diary of someone’s private notes, social media is a different proposition because it is used with the intention of being seen by others. You need to keep in mind that your own social media ‘audience’ could include solicitors investigating a personal injury claim made by you. It has become standard practice for law firms representing claimants to warn their clients that social media postings may be analysed by the third party insurers or their lawyers. You can restrict what others see of your profile and posts via the privacy settings of your social media account – and you should do so. In principle, anything that is left visible could end up being used against you. A stark illustration of the sort of nightmare scenario which can unfold for a claimant in relation to social media is the case of Jeffrey Loveday. He claimed compensation for a back injury suffered as the result of a road traffic accident. the airport staff had been most helpful in assisting him in using a wheelchair to negotiate the transfer process. The insurers tested Mr Loveday’s evidence via a combination of surveillance and the internet, which included monitoring of his Facebook account. The photographs posted on social media did not support the Lovedays’ contention that they had travelled by air. This evidence came to light in the course of contempt of court proceedings against the couple. Generally, the photos depicted Mr and Mrs Loveday in a relaxed and happy mood. However, one of the photos showed Mrs Loveday standing by what appeared to be a Land Rover Discovery, with a caravan attached to it. It turned out that the couple had not travelled to Lake Garda by air at all. They had travelled by car, right across Europe, and Mr Loveday had done all of the driving. Mr Loveday received a nine-month prison sentence and Mrs Loveday was given a six-month suspended sentence. But is this trawling of social media not all an unacceptable “breach of privacy”? It is easy to think that this approach by insurers is somehow “unfair” – that they should not be able to rely upon information which has been obtained by surveillance, in this way. There is a balance to be struck between the interests of the parties, for sure, but it is difficult to disagree with the proposition that parties in litigation must tell the truth. If untruths (or even exaggerations) relevant to the issues in the case are identified by way of a search of social media accounts, it is difficult to see any meaningful challenge to such evidence being available. So, be careful what you post. It can – and probably will – be used against you in negotiation and litigation. Learn how to operate the privacy settings on each social media channel you use and, even then, be careful what you post (and always tell the truth!). 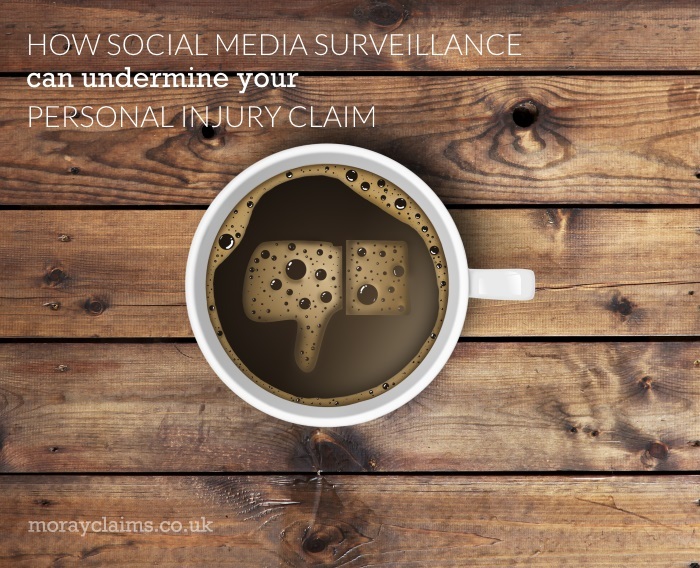 We hope you have found useful things in this article on how social media surveillance can undermine your personal injury claim. If anything is still not clear or if you have any supplementary questions, please get in touch. All initial enquiries are free of charge and without obligation. You can also get in touch with us if you have any questions about the personal injury compensation claims services offered by Moray Claims / Grigor & Young LLP. You can contact either of our accredited, specialist personal injury solicitors – Peter or Marie – via 01343 544077 or you can send us a Free Online Enquiry.